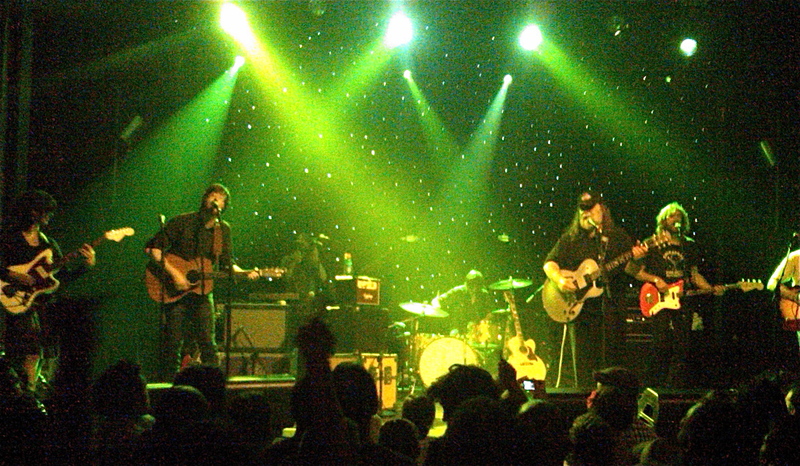 Roky Erickson and Okkervil River rocked Webster Hall | Will You Miss Me When I'm Gone? As unlikely as it may have seemed at first, the new collaboration between psychedelic rock legend Roky Erickson and Austin, Texas-based band Okkervil River, the results are stunning. Their new album together, True Love Cast Out All Evil, was the first evidence of a truly symbiotic musical relationship. But with enough studio tricks, just about anybody can make a decent album. The true test is in live performance. Well, they proved to a New York audience — a melding of gray-beard, old-school Roky fans and younger Okkervil River aficionados — at Webster Hall in the East Village last night (May 25, 2010) that they really know how to kick out the jams live, too. From the very first chords — wisely not something from the new album, but a scorching version of Roky’s classic “Night of the Vampire” — it was evident that it was going to be a show to remember. And it just got better from there. Okkervil’s frontman, Will Sheff, who with his beard and spectacles looked every bit like a long-lost son of John Lennon, spent the 90-minute set grinning from ear to ear as he played out his guitar fantasies onstage with Roky. This was clearly a labor of love for Sheff and his band. Okkervil River was definitely not a backup band, but a true collaborator with Roky. But it felt nothing short of joyous and spontaneous. It kept the energy going with a perfect flow of songs, mixing new and old, and pacing things with a sprinkling of slower numbers amid the rip-roaring howlers. 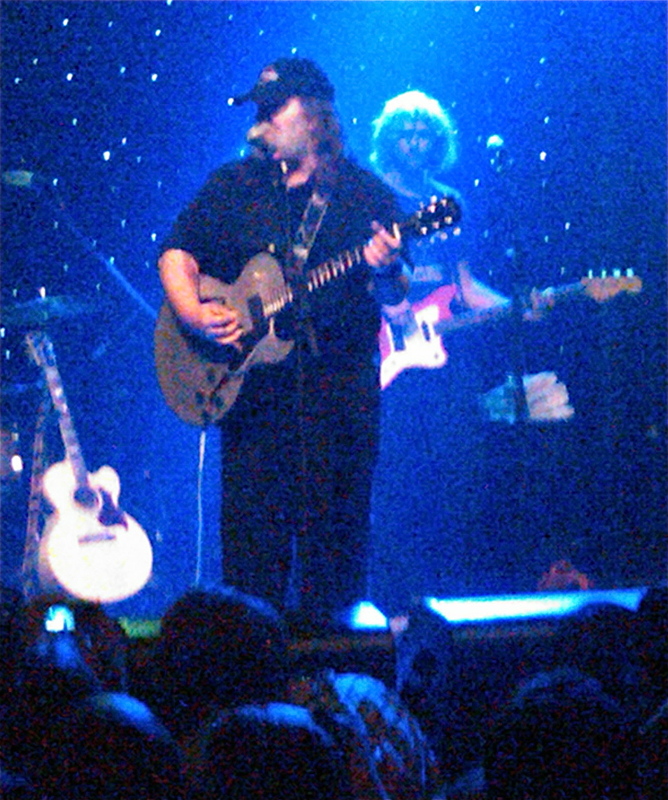 The evening ended the only way it really could have, with a blast-furnace scorcher of a version of “You’re Gonna Miss Me,” a song that Roky (born Roger Kynard Erickson on July 15, 1947) wrote at age 15. I know it’s only the end of May, but I left this show last night feeling like it was the show of the year. I certainly won’t forget it anytime soon. 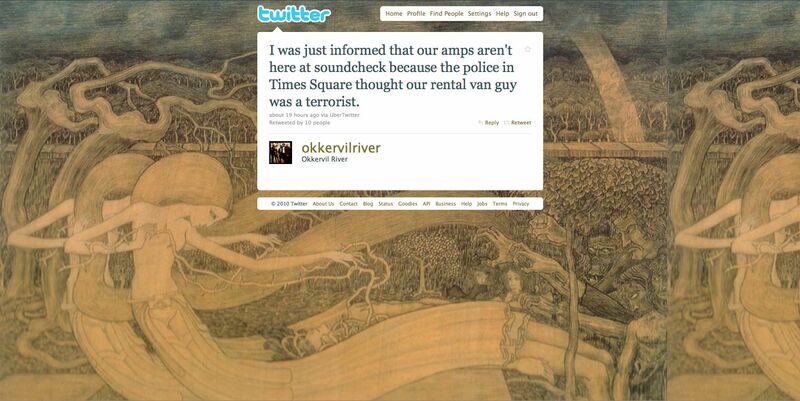 While you never know for sure if things that people put out on Twitter are true or not, Okkervil River tweeted hours before last night’s show that the band’s amps were not at soundcheck because of a misunderstanding with the NYPD in Times Square. At this hypersensitive time in New York City’s history, anything is possible. Okkervil River didn't have its amps for soundcheck last night. Something about the NYPD. The opening band, Brooklyn’s Bird of Youth (a side project for Elk City‘s Ray Ketchem) was suitably honored by the position, and even performed one of Roky’s songs — with permission. Meanwhile, Charles Bissell, guitarist and “Pedal Boy” genius of The Wrens, could be seen backstage through the green room window. Since he has worked with Bird of Youth, playing on that band’s album, and has toured with Okkervil River and recorded with Will, I was expecting him to hit the stage at some point. Sadly, that never happened. This entry was posted in Concerts, Music, News, Pop and Rock and tagged 13th Floor Elevators, Austin, Bird of Youth, Charles Bissell, Elk City, New York City, NYPD, Okkervil River, Pedal Boy, Ray Ketchem, Roky Erickson, The Wrens, Times Square, True Love Cast Out All Evil, Webster Hall. Bookmark the permalink. having played an excellent set. Very impressive. I want to hear their songs again. Truth be told, Roky wasn’t in good voice nor did he seem comfortable but the choice of songs and the band’s enthusiasm made up for it. I agree that Bird of Youth did a credible job. I make it a point to catch opening acts whenever possible. I’ve discovered some performers I really love in that way. Musically, the band was fantastic. I think Bird’s lyrics were not up to the standards of the melodies and arrrangements, though. And the singer’s technical difficulties — she sang very flat for the whole set — that really detracted from my enjoyment. However, I think nervousness at playing for such a big crowd was a factor, so I’d really love to give Bird of Youth another shot, but in a smaller venue where I suspect they are much more comfortable at this stage of their career. As for Roky, though, I couldn’t disagree more. I think his voice was in pretty good shape, but he was handicapped by his apparently inablity to sing into the mic. I’m sure you noticed Lauren trying valiantly to urge him to sing into the mic, to no avail. He seemed more comfortable than I expected him to be, though I suppose my expectations were probably different than yours. But again, I agree that the choice of songs (and the programming of them) and the band’s enthusiasm had a tremendous impact. Thanks for reading Will You Miss Me When I’m Gone?, Rich, and thanks even more for taking the time to write. Come back anytime! This was a good review. I really wish I could’ve attended this, but in any case, I’m curious if anyone knows what Roky song Bird of Youth performed. Thanks for the note, Matt. I don’t recall which Roky song Bird of Youth did, but I’ll find out and post here. Meanwhile, feel free to add my blog to your blog roll. Bird of Youth played “I Had To Tell You” which is from the Elevators’ “Easter Everywhere” album. Thanks so much for the info, Rich.